Having been a mechanic for 25 years, Don was troubled with hand flexibility issues that made it hard to continue playing his 34” 4-string bass. He was looking for a short scale bass that would still sound like a long scale and would be comfortable and lightweight enough to play from his favorite chair. We talked about how to customize a bass that would fit his needs. He wanted the look and size of a Les Paul Jr., so I suggested my Lesquire shaped body that I had used on some previous T-style guitars, and we chose swamp ash wood to cut down on weight. I set up the bass with a 30” conversion neck, which would fit a standard bass neck pocket and bridge positioning. The snappy tone of the swamp ash and the quick attack of a maple neck would combat the concern of getting a muddy bottom end. He would get a nice, clear sound with the custom Rutters bridge I had chosen and obtain clarity and brightness with Lawrence pickups, which coincidentally fit the request for his favorite P/J setup. Don’s finished bass played with the even and full long scale sound he desired. 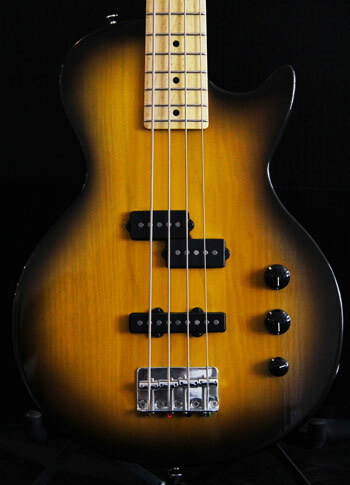 The solution of a short scale bass alleviated Don’s limited flexibility, but there are other problems these basses can resolve. Not only is a short scale bass ideal for bassists with smaller hands, but also they help guitar players experience a natural, comfortable transition when switching between the guitar and bass. This entry was posted in Story Behind the Guitar and tagged bass, bodies, neck, pickups, wood. Bookmark the permalink. This bass has made playing again fun and painless. As anyone that has used and abused their hands thru the years can tell you arthritis is no fun. This bass has every bit the sound, punch and clarity that my old Precision P&J set-up had, maybe even better. This combined with an Ampeg amp gives me every sound I could want. Thanks for posting my bass. It is really cool!!!! Congrats to you and your special Bass. You had the right man build it and he knows what “Custom” is all about.